Wearing metal braces isn’t the only way to repair a crooked smile. Our skilled dentists know how to straighten teeth without awkward wires and brackets using discreet, comfortable Invisalign® clear braces. 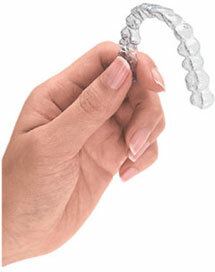 Invisalign clear plastic aligners work like transparent braces that fit over your teeth. 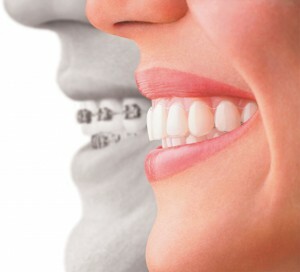 Invisalign dentists create a series of aligners for each patient. You’ll wear a single set for about two weeks, and then your dentist will exchange it for a new set. Over a period of months, the trays slowly exert pressure that moves your teeth into their target positions. Aligners can correct a variety of orthodontic problems for adults and teens, and because they’re virtually invisible, no one has to know that you’re wearing them. Because Invisalign treatment cost is based on the extent of orthodontic correction needed, you’ll need a professional consultation to obtain an estimate. Extensive problems are likely to raise your Invisalign cost. However, many patients find that they can get Invisalign in Sweet Water for about the same price as treatment with traditional braces. Your Invisalign cost can be reduced greatly by your dental policy. For more information about your Invisalign insurance coverage, contact your plan provider. We can also help you get affordable Invisalign correction through our flexible, low-interest financing options and convenient payment plans. Contact us to learn more. Invisalign treatment time generally depends on the amount of rotation, straightening or repositioning required to correct your smile. Most adult patients can achieve correction in 10 to 12 months, but it can take up to two years to obtain the desired results. Correction times vary in teens and young adults. After completion of your treatment, it may be necessary to wear Invisalign retainers for long-term maintenance. Is Every Dental Provider an Invisalign Dentist? Special training is required to perform Invisalign dentistry. A licensed orthodontist or a general dentist who has completed Invisalign training is qualified to administer the treatment. Invisalign dentists have the necessary skills and experience to achieve the best possible results in the shortest time span. Many patients ask, “Is Invisalign as effective as braces?” If you need minor correction, the answer is yes. When it comes down to Invisalign vs braces, several factors should be considered before making a decision. Invisible aligners do provide a discreet and aesthetically superior way to correct orthodontic problems, and because they’re removable, they make it easier to perform oral hygiene tasks that keep your teeth and gums healthy. For people with mild or moderate conditions, Invisalign is often the best choice. However, Invisalign may not be able to correct severe bite or alignment problems. The best way to determine if treatment with plastic aligners is right for you is to set up a consultation with one of our experienced dentists. For many people, Invisalign benefits clearly trump the benefits of braces. Here are five impressive perks that Invisalign patients enjoy. Invisalign is an appropriate treatment choice for adults and teens with mild to moderate orthodontic problems. Children are generally not good candidates because their jaws and mouths are still growing, which makes their orthodontic needs more complex. Invisalign dentists don’t recommend Invisalign for adults who have severe crowding, spacing or bite problems. Can you get Invisalign on just the top teeth or bottom teeth? It is possible to treat just the upper or lower teeth with Invisalign, but it doesn’t cost any less, and you’ll get better results if both arches are treated. Can I get Invisalign if I’m a smoker? You can still use aligners if you smoke, but be aware that tobacco products may visibly stain the plastic. Will Invisalign Treatment Change My Lifestyle? In general, wearing plastic aligner trays doesn’t interfere with lifestyle choices or daily activities. You remove the trays before you eat or brush your teeth, so there is no special diet or hygiene equipment needed. Chewing gum is not advised because it can stick to the aligners. The easiest way to clean your aligners is to use the Invisalign cleaning system. You can obtain one from our office. Otherwise, you can brush and rinse them under cool or lukewarm water. Avoid using hot water; this could warp or damage your trays and render them ineffective. If you’re excited about getting a great new smile with Invisalign in Sweet Water, we’re here to answer your questions about Invisalign cost, Invisalign treatment time, and other details. Contact us today to set up a consultation.